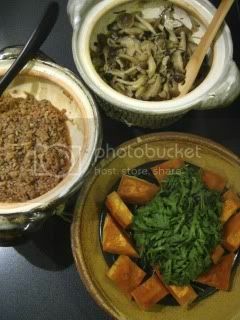 Quick and easy meal with three cute donabe pots. 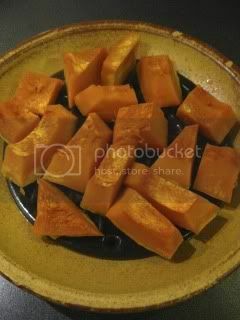 With donabe steam-roaster, "Tochinsai", I cut kabocha into cubes and simply steam-roasted them until tender (about 4 minutes with 700-W microwave). Then, I added a small bunch of chrysanthemum leaves and microwaved again for another 1 minute. In this way, all the nutrients are kept inside of each vegetable. Also, I like kabocha microwaved in Tochisai so much better than when it is boiled! By steam-roasting in Tochinsai, kabocha tastes more concentrated in flavor and the texture becomes nicely dense, instead of mushy. With mini-size classic-style donabe, "Hakeme", I made simple seasoned ground chicken ("tori soboro"), and with mini-size classic-style donabe, "Rikyu-Tokusa", I made yuzu-kosho marinated mixed mushrooms. To make this, I sautéed about 12 oz of mixed mushrooms (shimeji, shiitake, and enoki) in 2T olive oil over medium heat, deglazed with a tablespoon of sake and cooked for additional 2-3 minutes. Once I turned off the heat, I added the marinade mixture (3T olive oil, 1 tsp shio-koji, and 2 tsp yuzu-kosho) to the mushrooms. These two mini-donabe dishes were served as condiments for kabocha and chrysanthemum leaves. 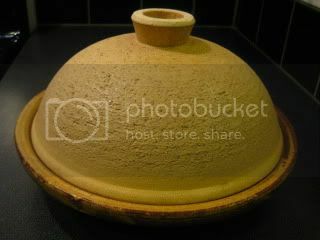 What a tasty balanced donabe meal, and so easy to prepare. They are all great hot or at room temperature.